General access to information about appropriate selection, design and management of sprinkler irrigation systems is not available to farmers, irrigation designers and advisers in Victoria. There are no measures of the economic and environmental benefits that broad scale use of efficient sprinkler irrigation systems on dairy farms will deliver to catchments. Such information is required for catchment planners to be able to assess the likely impact of policy initiatives related to farm irrigation system infrastructure. 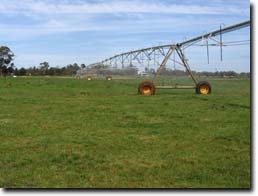 This project was funded through the former Department of Primary Industries, Dairy Australia (external link), Murray Dairy (external link), former Department of Sustainability and Environment (external link), CRC for Irrigation Futures (external link) and it’s objectives are strongly aligned with State Government and Dairy Australia's strategic directions for more efficient use of water. Information Booklet summarising recent investigations into the applicability of alternative irrigation systems on dairy farms. 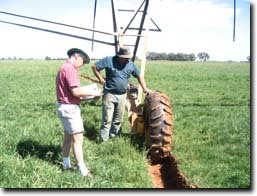 Irrigation System Selection and Design Guidelines - a set of guidelines to provide direction for farmers going through the process of selecting an appropriate irrigation system for their requirements. This will also provide information to designers to ensure that systems are designed to meet the requirements of the dairy industry in northern Victoria. It will include results from this project, and supersede the need for the Information Booklet. Catchment Planning Information - The package will provide catchment planners with information to assess the benefits and costs of policies related to investment in dairy farm irrigation system infrastructure. The package will contain information that quantifies the seasonal water balance under dairy farm border check and sprinkler irrigation systems for a range of soil and watertable conditions across the Shepparton Irrigation Region. Economic data quantifying the worth of widespread use of sprinkler irrigation systems will also be included. 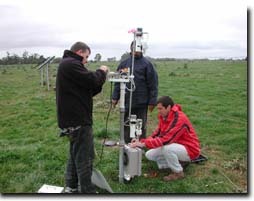 Setting up Bowen Ratio equipment for measuring water use in pastures. Field sites will provide information on irrigation performance of border-check and sprinkler irrigation farms. Wheel rutting is a common issue that results following installation of centre pivot irrigators. Notes on irrigation system performance on dairy farms in Victoria (external link) on the GRDC website. Information on a range of different sprinkler systems (external link) on the Queensland Department of Natural Resources and Mines website. A paper on ‘Centre Pivot and Lateral Move Machines in the Australian Cotton Industry’ (by J.P. Foley and S.R. Raine) is available for download from the University of Southern Queensland website. This paper describes the use of centre pivots and lateral move systems in the cotton industry and discusses many of the issues that dairy farmers may face when converting from border-check to sprinkler irrigation.